Can Venmo’s Impressive Success Protect it from Competitive Threats? Gone are the days of fumbling for cash, extended IOUs, and awkward splitting of bills; money-sharing app Venmo has quickly become an integral part of the millennial’s financial world. The person-to-person payment app allows users to send and receive money linked from bank accounts or credit cards, making financial transactions much easier. The ubiquity of the PayPal-owned app can be seen in how the app’s name has quickly become an ever-present verb in the typical college student’s vocabulary. The app has received acclaim for its accessibility and elegant design. Time magazine named Venmo one of the best apps of 2016, while Fortune named it one of the breakthrough brands of 2017. The app has been driven by college students since its inception. It was founded in 2009 by Andrew Kortina and Iqram Magdon-Ismail, who met when they were freshman year roommates at the University of Pennsylvania (Wikipedia). When Magdon-Ismail forgot his wallet when visiting Kortina, the idea for Venmo was sparked when the two realized the lack of an easy way to borrow money from friends. The duo’s initial concept used text messages to transfer money, but then evolved to a mobile app that was publically launched in 2009. In 2012, the app was acquired by Braintree for $26.2 million, and settled into its current ownership by Paypal upon its 2013 acquisition of Braintree. The app’s success is heavily propelled by millennials. Of the 65% of young Americans who use mobile payment apps, 66% use Venmo. Why has Venmo in particular been so popular? Many attribute its success to its marriage of money transfer with a social media-like interface. Exchanges are set to publically display on a newsfeed of contacts by default, and users are required to use words or an emoji to describe every transaction. Users can like or comment on public transactions, facilitating a feeling of community and camaraderie. PayPal CEO Dan Schulman argues that Venmo is “not a payment transaction, it's kind of an experience.” “90%-plus of all Venmo transactions are open to somebody's friends [and] network… So if I want to see what you're doing, who you're dating, what you did, I can just go into your Venmo feed and see it,” he notes. This social side of the app drives user loyalty and engagement, as Venmo has found that many users open the app many times a week to see what their social network is up to. The app has succeeded in consistently expanding its user base and payment volume. 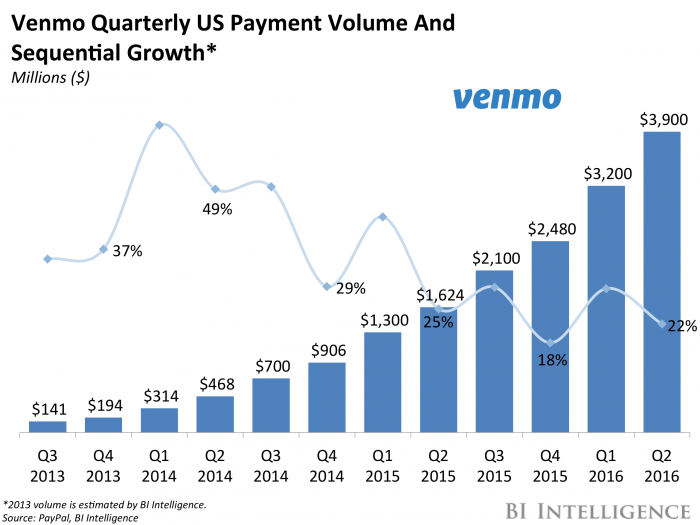 In the third quarter of 2017, Venmo processed $9 billion in payments, up from $8 billion and $6.8 billion the last two quarters. Payments processed have nearly doubled year after year. While the company doesn’t release user data, Verto Analytics estimates Venmo is used by 7 million people monthly. Conventional wisdom holds that Venmo has the largest market share of any mobile person-to-person payment app, likely because its social element sets it apart from similar apps Google Wallet, Apple Pay, Popmoney, and Square Cash. Now, the app is looking to generate revenue beyond the 3% transaction fee for credit cards and merchant fees from small businesses that accept payment with the app through the “Pay with Venmo” program, launched July 2016. Many expect that Venmo will expand this program to millions of merchants this year. Venmo has also been testing its own version of a physical debit card that would aid in this quest to expand to more stores. This quest for revenue is increasingly important in the face of the increasing competition in the mobile money exchange market. While Venmo has succeeded in beating existing apps, can it beat new apps backed by some of the world’s most powerful companies? After six years of work, Zelle, a payment service backed by over 30 US banks, was launched as an app on September 12. Banks such as Bank of America, Citibank, JPMorgan Chase and Wells Fargo have teamed up to allow their customers to send money through the bank’s own mobile app to anyone with an account at a participating bank. Zelle works through banks’ existing mobile apps, used by tens of millions of Americans, as well as a stand-alone app. Zelle’s backers hope that the convenience of a money-sharing system built into existing banking apps will set it apart from competitors that require users to download a separate app. Additionally, Zelle has the ability to transfer money into bank accounts immediately, while Venmo and other apps usually take at least a day to transfer money from the app to bank accounts. Zelle lacks Venmo’s social aspects of a newsfeed, comments, or likes, leading financial industry research firm director Michael Moeser to argue that the key market for Zelle is users over 45 who haven’t used mobile payments yet. “Cash is the common enemy,” agrees Venmo spokesman Josh Criscoe. Will the social side of Venmo be enough to keep young users from migrating to Zelle for its increased convenience of instant bank transfers and in-app utilization? Venmo appears to be aware of the threat posed by Zelle, as it is rolling out an instant bank transfer feature for an additional $.25 fee. Banking behemoth Goldman Sachs has also dipped into the person-to-person payment app domain. In 2015, the bank partnered with Chinese investment firm IDG Capital Partners to invest $50 million to Circle Internet Financial, which uses the technology of Bitcoin to make person-to-person money exchanges easy and possible across international borders, unlike Venmo. The app, Circle Pay, offers free instant bank transfers, absorbing the transaction cost in the hopes of drawing more users. Circle also offers FDIC insurance for payments, unlike Venmo and its competitors. On November 7, Apple launched the beta version of its own person-to-person money transfers system, Apple Pay Cash. The system allows users to send and receive cash inside the iPhone Messages apps, making additional apps or even mobile banking apps unnecessary. The feature is an extension of the existing Apple Pay, which allows users to use their phones to pay at stores, online, and in apps. Like Venmo, Apple Pay Cash allows free bank transfers and no fee for debit cards but a fee for credit cards. Only iPhone users running iOS 11.2 on their phones can send and receive money using Apple Pay Cash, limiting the program more than apps that can run on non-iPhones. Will this limitation prevent Apple Pay Cash from taking over the market? Venmo is currently holding on to the lion’s share of the person-to-person payment app market, but it’s uncertain how the app will maintain its dominance faced with constantly evolving competitors. One thing seems certain, however: mobile money transfer, driven by millennials, is here to stay.